We are counting 3 storms that will cruise through the area over the next week or so as our weather pattern remains unstable. We do not expect these storms to produce much precipitation, but our weather, especially in the Sierra, will remain cloudy and very windy. Perhaps more important is trying to figure out what happened starting around the 1st of January. We have been on the storm track, literally, for the past 3 months. We believe that the solar minimum coupled with a weak to moderate El Nino is what is effecting our weather. If you take a look at the following chart, we could be seeing more of the same, possibly lasting through 2019! 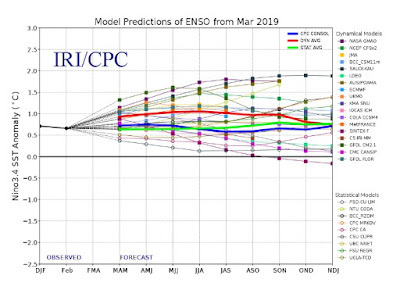 With the exception of 1 outlier, the weather models all agree that El Nino will last through the end of the year. Solar minimums can last decades and we believe that in large part, our weather pattern change which started 4-5 years ago is being influenced by these two variables. Of course many think a third variable is man-made global warming. We here at TWB simply do not trust the data. Too often the numbers have been fudged and the "scientists" responsible for fudging the numbers have been caught, which is completely mucking up the science. We also keep reading lines like, "This has not happened for over 100 years". That just tells us that if the planet is warming significantly, this is not an isolated incident. The disparity of money going into proving man-made global warming and disproving it is also way too great to get objective research. Our computer scientists here at TWB have been modeling data for over 3 decades and know how simple it is to make the models sing your tune. We are not saying this man-made phenomenon does not exist, we are saying we simply do not know and do not trust the current reporting environment. The other thing that you rarely hear about when the global warming topic comes up is this; fossil fuels feed our planet. Plain and simple. They provide the energy for mass agriculture and transportation. If we were to stop using or even significantly cut down on the use of fossil fuels, millions would starve. Who gets to make that decision? So if global warming is really happening, what is the solution? Until we hear a solution that works for the entire planet, then the conversation is not worth having. As we move on through spring and into summer, we do expect periods of unstable weather. However, with the tilt of the earth and position of the sun this time of year, these storms will become weaker and weaker. However, we expect a very windy spring and do not believe we will hit our summer weather patterns until at least late June. I think we can expect to sprinkle in a couple of major winter storms between now and then in the higher elevations. When those storms come, we will be there. Excellent questions. I wish I could answer them. El Nino's are difficult to predict, as are many of the factors that may or may not influence our climate. Do solar minimums play a role? I have no idea, I am not sure that has been studied. The monsoon season is something I have never studied. 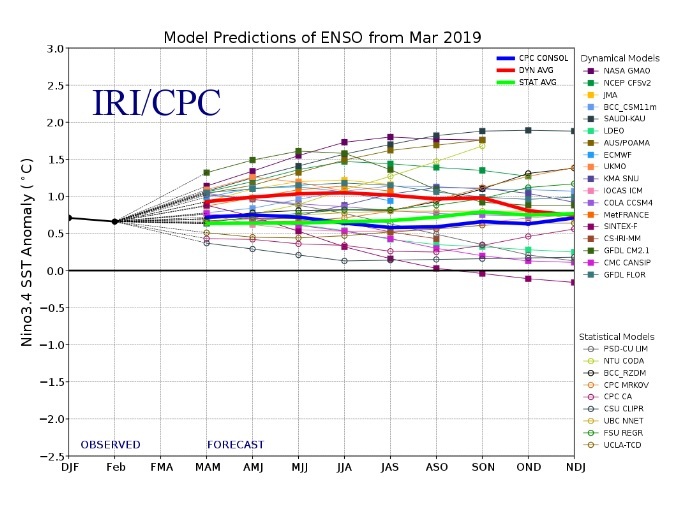 I did take a quick peek to see if there were any predictions for the 2019 monsoon and came up empty handed. My apologies.